Now as one might expect, there are also men on the bike lanes of Copenhagen. With 36% of the population being daily cyclists a good guess is that half are male. Our blog, of course, chooses to focus on the other half but we thought that we'd chuck a couple of unisex photos of stylish Copenhageners online to provide a brief sense of balance. 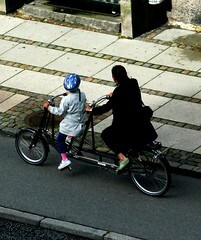 Couples heading off for a party, or a visit to the cinema or any manner of event will often choose to ride together. It's the cosy thing to do, of course. Holding Hands, originally uploaded by 16nine. that's a pretty cool tandem. nice shoes on those two, too.